Richard A. Econ of Lake Forest, Orange County, California was arrested on charges of burglary (California Penal Code Section 459-460)when he walked into Wal-Mart and tried to buy $100 worth of gift cards with counterfeit bills. The Wal-Mart clerk became suspicious after seeing the money, then called the store manager. The clerk then asked to look at Econ's license in order to detain him while they checked out the money. When it was taking too long, Econ fled the store. Within minutes of a brief foot pursuit, deputies had Econ in custody. 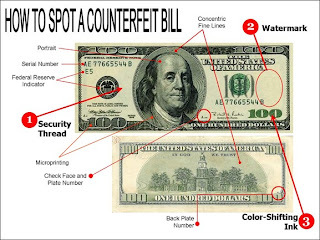 The U.S. Secret Service will be conducting further investigations to determine if counterfeit charges apply.